If you love animals, the zoo is a place that fills you with mixed emotions. On the one hand, seeing animals is a really fun experience. But on the other hand, these are captive animals who prefer to be in the wild. Many zoos play an important role in research and conservation, however. One could argue that there are great benefits to keeping animals in ethically-operated zoos. Yet even with that information, it is hard not to see a zoo as a type of “animal prison.” That is why stories of intelligent and crafty animals escaping the zoo are so fun to hear about! Many of the animals mentioned in these stories made it all the way to freedom as well, never having to return to captivity. Recently the Virginia Zoo reported that a female red panda had escaped, possibly due to aggressive behavior from males during breeding season. They believe the panda may have been trying to get away from an aggressive male when she slipped on a branch and fell outside her enclosure. While there have been several sightings, the missing red panda has yet to be located. While rare, zoo escapes do happen. Here are five of the most fascinating times some clever captive animals made a break for it. I don’t think we should be messing with octopuses. It is entirely possible they are smarter than us. This spring at a New Zealand aquarium, a male octopus named Inky made a daring, and quite impressive, escape to freedom. Aquarium staff noticed Inky was missing from his tank one morning. They managed to piece together the details of his escape by noting the track marks he left. They believe Inky’s escape began when the lid to his tank had been left ajar. This allowed Inky to escape his tank and crawl across the floor. This was where his escape became quite daring. He then squeezed through a drainpipe which led to the ocean — and more importantly, freedom! Somewhere in the Pacific Ocean, there is a free octopus named Inky. But you never know, he might decide to squeeze through that pipe again and go back to the aquarium. Octopuses are known for being daring escape artists. At other aquariums, there have been reports of them sneaking out of their tanks and into other ones in order to feast on the fish inside, then sneaking back into their tank afterward. They’ve even been known to sneak aboard fishing vessels and make a snack out of the day’s catch. Imagine being a capuchin monkey at a zoo. You and your seven monkey pals want to be free, but these humans keep you confined to a cage using locks. You think to yourself, “What can I do? I don’t have the keys to the locks and this cage just won’t budge.” But then, one of your pals figures out he can smash that lock with a rock. You would all make a mad dash to freedom, right? Well, that’s exactly what happened at a zoo in Brazil in 2012. Eight capuchin monkeys figured out how to smash the locks to their cages and bust out. 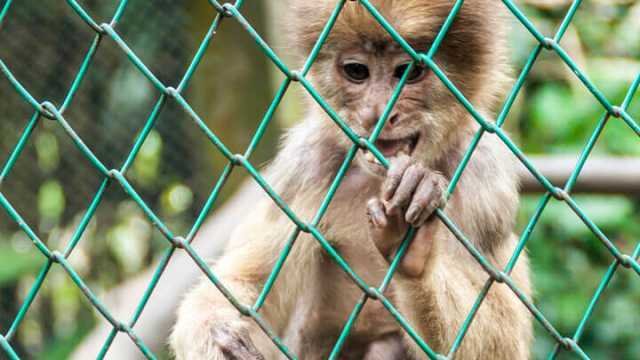 Only four of the monkeys were re-captured and brought back to the zoo. The rest are assumed to be living under false identities somewhere. Capuchin monkeys have been observed using rocks to bust open nuts in the wild before. Indeed, these jailbreak monkeys sure found another useful way to use them. There are several aspects to this story that animal-lovers may find enjoyable. The first is that the San Diego Zoo gave this 250-pound orangutan the very un-orangutan name of “Ken Allen.” He would eventually also go by the nickname “the Hairy Houdini” due to his multiple daring escapes. Ken Allen’s escapes never seemed to go too far, though. He seemed more interested in just being able to escape as opposed to actually leaving the place he was born in 1971. He scaled the wall of his enclosure for his first escape and was found wandering the public paths in the zoo, stopping to look at the different animals in much the same way zoo patrons would. He was escorted back to his enclosure without incident and he never acted aggressively towards any humans. He did act somewhat aggressively towards another orangutan on his next escape attempt, however. After scaling the wall to his enclosure again a few weeks later, Ken stopped in front of another orangutan enclosure and started throwing rocks at Otis, an orangutan he had once shared a pen with. Evidently, there may have been some bad blood there. The next month, Ken escaped yet again, though this time his method was different. Staff left a crowbar in the enclosure and another orangutan used it to pry open a window and allow Ken to escape. Finally, zookeepers decided to keep Ken in an enclosed room until they could figure out how to keep him from escaping. They spent tens of thousands of dollars hiring rock-climbers to detect all the different places Ken could have used to scale the wall. Eventually, the zoo was able to contain Ken, who died of cancer in 2000. Ken Allen became somewhat of a folk hero due to his escapes. “The Ballad of Ken Allen” was recorded by Dennis Gerstein the same year as his daring escapes. 1. A Bengal tiger has broken into the zoo and decided to stay. 2. I’m so bad at my job that I don’t know how many tigers I am supposed to be looking after. Well, staff at an Indian zoo in 2013 were faced with that conundrum after a Bengal tiger broke into their zoo. The male tiger was evidently attracted to a captive female Bengal tiger. And because love knows no limits, he found a way inside. Zoo staff decided to let the animal stay for a few weeks and get to know the captive female Bengal tiger a little better. It seemed as though the zoo’s new visitor was getting used to captive life, but just like that he found a way back to the wild. He is believed to have scaled a two-story wall in order to escape into the nearby forest. Zoo escapes have become far more entertaining in the new social media age we are living in. Certainly, this was the case when a cobra escaped the Bronx Zoo and then set up a Twitter account to tell us all about her travels. She escaped while in a non-public area of the zoo, but nobody is too sure how exactly she got out, or what thumbs she used to tweet so frequently. An assumedly fake Twitter account (could have been real, we don’t know) capitalized on both the escape and the new Twitter craze that was dawning in 2011. Anyone know if Rebecca Black lives in NYC? No reason. If you want to find me, I right in front of the original Ray’s Pizza. Holding very still in the snake exhibit at the Museum of Natural History. This is gonna be hilarious! Donald Trump is thinking about running for president?! Don’t worry, I’ll handle this. Where is Trump Tower exactly? Zoo staff found the cobra six days later coiled in a dark corner of a non-public area of the zoo. Somehow she still manages to tweet, as her account is still active. To all these daring jailbreaking animals, thank you for the entertainment. And for those of you who were never recaptured, never take your freedom for granted — and good luck to you! Hey Buddy!, I found this information for you: "5 Fascinating Times Animals Escaped From The Zoo". Here is the website link: https://www.thealternativedaily.com/5-zoo-animal-escapes/. Thank you.